Clay, Darcy & Mason have teamed up to bring 210 Barber Shop to Sydney Road. 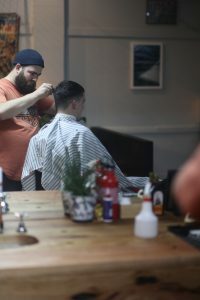 They offer an incredibly laid-back and relaxed atmosphere, along with all the traditional barbershop services you’d expect. They’re already proving to be a popular choice as we often see customers relaxing on the couch, waiting for a trim or a brand new hairdo. The boys are urging Instagrammers to #keepmelbournehandsome and seem to be doing a fine job of helping them achieve this!